Believing that life continues on after death, and that our relationships can simply be transitioned is one of the great blessings of the spiritual path. And I can’t help but think that the benefits are enjoyed on both sides. 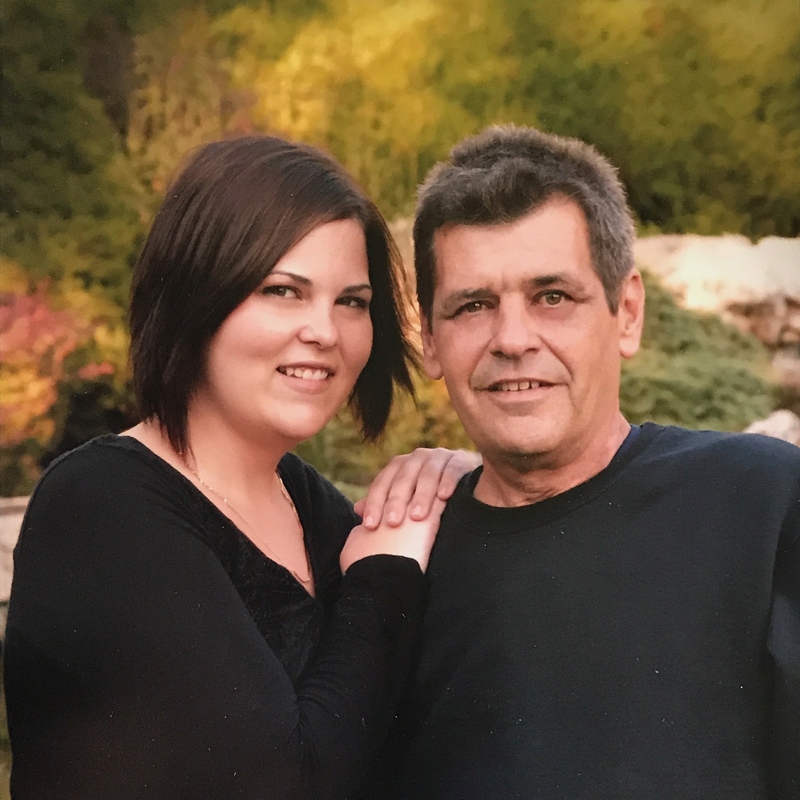 As many of you know, my daughter Danielle lost her dad, Rick two years ago to a heart attack. She was just shy of her 27th birthday. Watching her struggle with not only the loss of her dad, with whom she was especially close, but the responsibilities for things most us of are able to grow into, has been challenging to say the least. There’s nothing I can think of that is worse than having to helplessly stand by and watch your child suffer, knowing there isn’t a damn thing you can do to make her whole again. Yet, even in the darkest times there was the light of knowing that Danielle believed in life after death, and also knew how to look for signs thanks to his training. This only came about in the years just before his passing. Prior to that Rick adamantly refused to acknowledge his strong psychic abilities (he had shut them down in his teenage years in order to be normal) and had prevented me from teaching her. Because of that training, that belief, Danielle’s journey out of the darkness of grief and depression has been shortened. And due to believing that her dad is still with her, and listening, watching for his signs, he has been able to help her reclaim her broken pieces, find joy and step forward into a new life. No doubt seeing his daughter happy again has been very satisfying. At Danielle’s request, I am sharing the story she wrote about her journey. She hopes that it will help someone else. I lost my dad two years ago; he was the light of my life, with his big smile and a laugh that would fill a room. I was 26, still living in the basement, and working two jobs in order to build up my hair salon business so that I could live on my own. I was content with where my life was; we both were. After getting through my teenage years (not the easiest), my dad and I eventually found our way to a good relationship. In some ways we were more like best friends than father and daughter. Like two peas in a pod we had grown to really like being together, and we both knew the only way we would leave each other was death. In August of 2016, after a long and drawn out 19-month probate process, I was finally granted ownership of my father’s house. What an experience going from living in a basement, never renting, to owning a large, spacious home on 2 acres. I wasn’t ready for the responsibilities of the house payments, insurance, taxes and maintenance. Within days I found myself hit once again with another round of deep depression. I wanted the house to burn down, or get washed away in a flood. I have never had this much on my shoulders before. I felt so lost and it didn’t matter how many people told me they were proud of me, I just could not feel it. I couldn’t even be happy that I owned the house my father built for me! The beginning of 2017 was rough. Dad’s angel anniversary is January 5th. Holidays, which used to be such a happy time for our family, just hurt more now than they bring joy. The depression that kicked in was by far the worst since he died. But, this time it didn’t show like the past times, it was deep, deep down instead. Then the anger started to bubble. I was lashing out at everyone around me, but the person I was really angry at was my father. Why didn’t you go to the doctor?! Why didn’t you take care of yourself?? WHY DID YOU DIE?!!!!! I got so angry with him that I didn’t care was happening around me. It took my roommate getting in my face for me to realize what I was doing. I begged my dad for signs that he was still around, but as Winter turned into Spring, I still had received nothing. In late April I finally heard from my dad. He appeared in two dreams over a period of two weeks. Both times he walked into the house, sat in the chair I used to sit in, and starred at me (while I freaked out because he was there). I kept saying, “Daddy where have you been? Do you know what life has been like without you? !” Then as soon as he was there, he was gone. Though those two dreams didn’t give me what I was looking for, I realized they were his way of showing me that he’s still here with me…and that he gets it. And even though my psychic ability to reach him is temporarily diminished due to grief, Dad found a way to make sure I knew. Knowing that my dad understood how I felt didn’t make any difference as my anger was driving me further into depression. I knew I was at my breaking point. How could I be so angry with a person who is dead? Dead!!! Either I crumble and lose everything, or I pick myself up and keep going. I chose to keep going. No matter what, I was going to survive. Not long after my decision to survive, my dad visited again—in a dream to end all dreams. My father walks in the back door, walks right past me and stops in the middle of the kitchen. I walk over to him, I don’t believe he is real. I slowly raise my arm to touch his shoulder expecting my hand to go right through him, but as soon as my fingertips touch him, a warm feeling surges through my veins. It feel his love wash over me entirely. It is like he was never gone. In that moment in my dreamland kitchen he and I are together again. The surge of love he sends also sends another piece of me back. A couple of days later I receive a confirmation that my dad had really visited me in that dream. I was chatting online with Sunset, a fellow player in my current favorite computer game. Sunset is a psychic but had not revealed that to anyone on our team. During our chat, Sunset was contacted by my father! She told me that my father did in fact pick out my dog. (I got an English bulldog a few months after Dad died), and plays with her. He also said to tell me that he would be leaving for a little bit, but I will know when he’s back because things will start moving. He also said to tell me he was proud of what I have accomplished. That was the moment I shifted. I noticed more of the pieces of myself were back! I decided to get out of my lala land and go back to my second job which I had quit right after Dad died. I’m not done with my bubble, but I know it gets thinner and thinner everyday. Now that I have more of myself back, I am finding more joy, and I know one day all my power will be back. I want to thank my mother. She has been there for every 7 am phone call, giving me encouragement even when I couldn’t hear it. Thank you, thank you for giving me a opportunity to write this. Love you mom. Love you dad.